LOS ANGELES, California (CNN) -- Thirty-eight years ago, Joseph McGinty Nichol was a boy in Kalamazoo, Michigan, playing with toy robots. 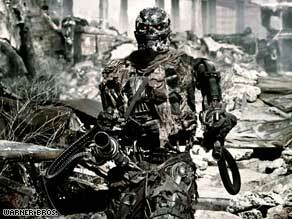 Many of the robots in "Terminator Salvation" are real machines, which increased realism, the cast says. Today "McG," as he is better known, builds and blows up real robots. The prominent filmmaker is the driving force behind one of the season's summer blockbusters, "Terminator Salvation," which is filled with very expensive and very explosive robots. The choice to use real robots when possible, instead of CGI (computer generated images), was deliberate, McG said. According to the director and the film's stars, the decision to use real machines was a testament to the growing sophistication of the moviegoing public, whom they believe can "feel" the difference between actors standing in front of a green screen versus actors interacting with the real thing. The director and three of his cast members -- Christian Bale, Bryce Dallas Howard and Anton Yelchin -- took a time out with CNN to explain why gravity and singed eyebrows both played a role in "Terminator Salvation." Bryce Dallas Howard: That was something that was really important to McG ... when an audience member sees this film, that they can actually feel what's occurring. I think that audiences are very savvy now. We can feel when something is CGI and that's no disrespect to CGI -- we couldn't do this movie without it -- but, whenever possible, in the tradition of Sam Winston, he wanted to build the robots. So a lot of what you see is real. McG: And if you drop something, we've spent our whole lives watching physics in play, and if you say, just have the CGI do that, people can tell something's off, and it releases you from being involved in the picture. So, we built all the robots, we built all the sets, we blew them up for real, a great many of us lost our eyebrows! Christian Bale: It was kind of comical at times because something that's meant to be so intimidating was actually surrounded by five guys with these kind of puppet rods I had to blank out or I would start laughing. But, the end result is something really formidable and you know, really iconic in movie history. Anton Yelchin: Now I'm obsessed with the robots! I'm so [annoyed] that this guy or whoever it is that's in charge of it wouldn't let me have one!